I continued south-east from Roseville towards Chatswood. About halfway to Chatswood, I saw something that made me laugh loud and take a chance on trying to photograph it. And the result in all its rushed and unskilled glory is what you see above. 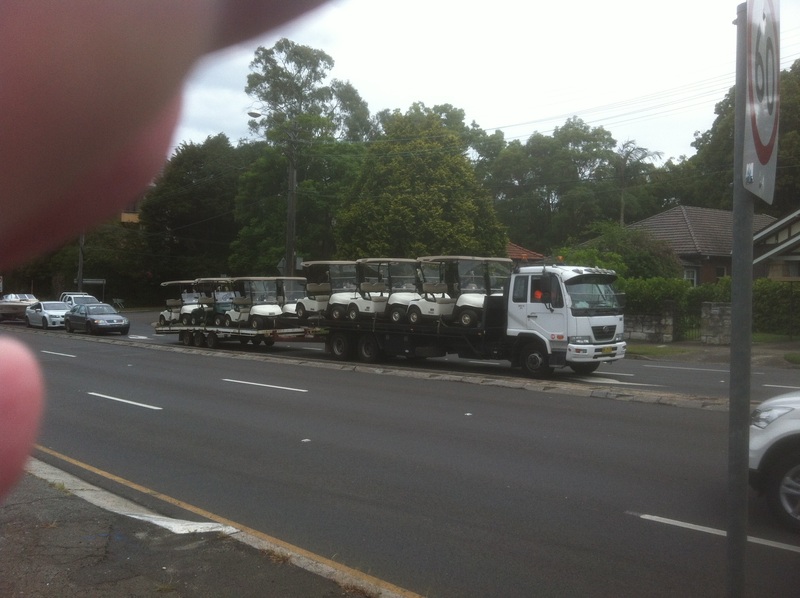 I’ve seen many car-transporter trucks in my life, but that was the first time I had ever seen a golf-cart transporter. One day, it may also inspire a LEGO build. I resumed my walk and not long after I began passing through Chatswood. And as I did, I realised that I has achieved a milestone. One Sunday way back in 2001 or 2002, I had walked from the Sydney CBD to Chatswood. I had been inspired to do so by a work colleague at the time who used to walk home from our Sydney CBD workplace to his then home in St. Leonards, which is a few suburbs before Chatswood. That Sunday, I decided to see if I could it myself – and after I did, I pushed on further to Chatswood. 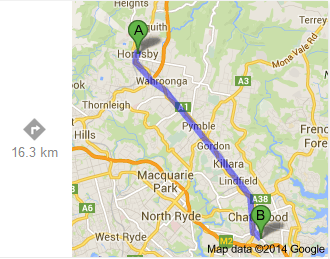 Which meant that altogether I had now walked all the way from the Sydney CBD to Hornsby. Today, could I complete that walk in one go? Back in 2001 or 2002 it had taken me just over two hours to walk from the Sydney CBD to Chatswood, and a lot of that had been uphill. Today, though, most of that walk would be downhill. So until Chatswood, it looked like I would reach my goal. Alas, as I left Chatswood and headed towards nearby Artarmon, two problems arose. The first problem was my legs starting to ache again like they had during last weekend’s walk. The second problem, though, was more worrying. My inner thighs were beginning to chafe. …but the more I thought about it, the more I knew that even if I did make it all the way to the Sydney CBD, I would suffer greatly for it in the days to come. So, with great disappointment, I decided to err on the side of caution and halt my walk in Artarmon. Instead of continuing along the Pacific Highway, I made my way to Artarmon station and officially ended my walk there. Not long after, I got a train back to the city where I had another nice dinner at Star Bar. I hadn’t made it to dinner all the way by foot – but I had still accomplished a 16-kilometre walk. As well, it had been unexpectedly pleasant. My next walk would take place two weeks later. It would complete a previous long walk, and also take me through my distant and recent past. This entry was posted in Action, Gratitude, Happiness, Inspiration, Life Challenges, Life is Good, Life Strategies, My Story, Travel. Bookmark the permalink.